Wing commander (Wg Cdr in the RAF, the IAF, and the PAF, WGCDR in the RNZAF and RAAF, formerly sometimes W/C in all services) is a senior commissioned rank in the Royal Air Force and the air forces of many countries which have historical British influence, including many Commonwealth countries but not including Canada and South Africa. 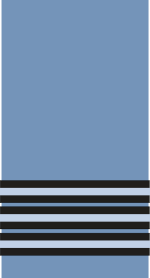 It is sometimes used as the English translation of an equivalent rank in countries which have a non-English air force-specific rank structure. It ranks immediately above squadron leader and immediately below group captain. It has a NATO ranking code of OF-4, and is equivalent to a commander in the Royal Navy and a lieutenant colonel in the British Army, Royal Marines and the US Army and United States US Marine Corps. Leslie Sidney Ford, DFC and Bar, RCAF World War II ace. A native of Halifax, Nova Scotia, and one of the youngest wing commanders in the history of the RCAF. He was promoted to the rank in 1943 at the age of 23 and was shot down and killed shortly thereafter. M. Hamidullah Khan, commander - Sector 11, Bangladesh Forces, War of Independence 1971, first provost marshal and commander of Ground Defense Command of the Bangladesh Air Force. After retirement in 1979, joined the BNP and embarked on a political career. Remained active until death on December 30, 2011. Humphrey de Verd Leigh, inventor of the Leigh light which was developed to spotlight U-boats as they surfaced at night. The Leigh light is reputed to have changed the course of the Battle of the Atlantic in World War II. ↑ "RAF - Commissioned Ranks". Royal Air Force. 2011. Retrieved 2011-06-17. ↑ Geldenhuys, Preller (2007). Rhodesian Air Force Operations with Air Strike Log. Durban, South Africa: Just Done Productions Publishing (published 13 July 2007). ISBN 978-1-920169-61-9.